Thursday September 15th 1921 I was sewing most of the day. hemmed napkins I got for Helen Louis. The girls to a luncheon at Mrs Lovelands. Ott went to Des Moines with the young folks. Hattie down there to supper. We spent the evening in little sitting room. I had letters from Lydia, Sue Reed, and Mrs Falk. She is in Davenport. Friday September 16th 1921 A hard rain last night. I was sewing some. But took a sleep in afternoon. Rob at home not very well. Cora took Hattie and me to town in the evening to a childs entertainment at Christian Church. We came home in taxi. Wrote Lydia and Mrs Falk. 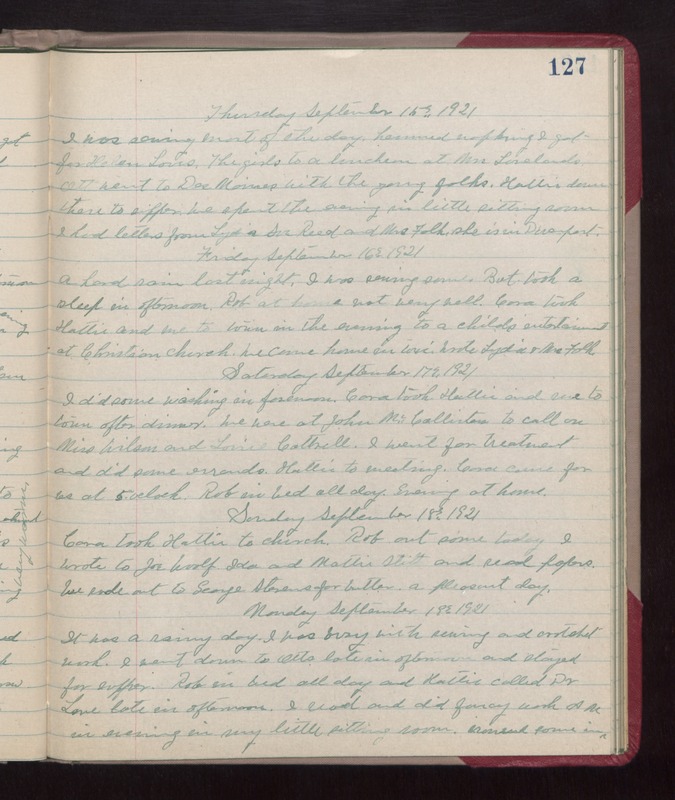 Saturday September 17th 1921 I did some washing in forenoon. Cora took Hattie and me to town after dinner. We were at John McCallisters to call on Miss Wilson and Lorie Cottrell. I went for treatment and did some errands. Hattie to meeting. Cora came for us at 5 oclock. Rob in bed all day. Evening at home. Sunday September 18th 1921 Cora took Hattie to church. Rob out some today. I wrote to Joe Woolf, Ida and Mattie Stitt and read papers. We rode out to George Stevens for butter. a pleasant day. Monday September 19th 1921 It was a rainy day. I was busy with sewing and crotchet work. I went down to Otts late in afternoon and stayed for supper. Rob in bed all day and Hattie called Dr Love late in afternoon. I read and did fancy work in evening in my little sitting room. ironed some in AM.